Our Books - Ampersand, INC.
Bertha Honore Palmer was the "Queen" of Chicago society from the time of her marriage to the very successful Potter Palmer in 1870 until her death in 1918. This is a well researched account of her impact on the social life of Chicago, her leadership as Chairman of the Board of Lady Managers for the Columbian Exposition of 1893, and her influence on the Art Institute of Chicago, to which she donated much of what has become a great collection of Impressionist paintings. The book includes 55 illustrations including mansions built in the Gold Coast area starting in the 1870s when Potter Palmer made the bold move north of Oak Street. He filled the swamp land with sand from Lake Michigan and began selling lots to his very rich friends--hence the name "Gold Coast." A picture of the Palmer "Castle" is included, along with views of the ballroom/art gallery, entry way and items rescued after the Castle was razed. Sally Sexton Kalmbach's gem is packed with carefully researched stories, which she tells with her unique sense of humor and easy style. 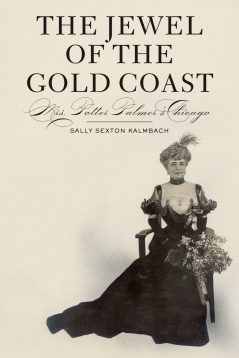 Sally Sexton Kalmbach is a fourth-generation Chicagoan whose family founded a Chicago-based coffee and tea company in the early 1880s, at the same time Potter Palmer was developing the Gold Coast. Sally has taught classes in Chicago history at the Newberry Library and has given numerous speeches and customized tours for individuals and small groups. Her expertise and ability to present the material in an accessible yet informative manner has earned her a loyal following. Her topics include: Chicago's Gold Coast, revisiting the Columbian Exposition of 1893, Mrs. Potter Palmer's Gold Coast, Women and the White City, Mrs. James Ward Thorne's Miniature Rooms and Chicago's Holiday Traditions. Sally is a co-founder of the Chicago History Women's Club, a board member of the Chicago Chapter of the Society of Architectural Historians, a volunteer docent at the Charnley-Persky House Museum and an active member of the Blue Dolphins Swim Club.